‘Investing and lending’ relates to the ways in which capital is made available to business enterprises for carrying out their investment ventures. External access to capital is found in the capital markets in the form of equity (including through stock exchanges or private equity) or debt from private and public financial entities. Capital is often provided as part of complex financial arrangements that put together a number of private and public financial entities. Such entities may be public, private or mixed, and the range of services that they offer varies. A number of these entities have recently developed standards that reflect concern for human rights and have started to adapt its practices to integrate social and environmental criteria in some of their financial services and products. These include institutional investors, and also private and public lending institutions. 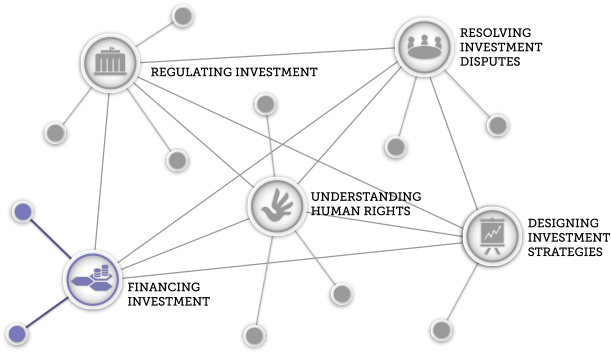 The Learning Hub’s work will contribute to current efforts to seek to clarify how these complex and multi-party financing relationships, products and services relate to the impact investments can have on people. The Hub will invite consideration of the role of investors and lenders in contributing to respect for human rights in investment, and will invite reflection on relevant lending and investing standards relating to human rights and their implementation.